SAN DIEGO, CA — WEDNESDAY, APRIL 9 — For savvy self-promoting chefs, it’s time to get on a roll. From aspiring culinary minds to seasoned and celebrity chefs, Chef’s Roll is a platform where chefs can tell the full story of their culinary life with a Facebook-LinkedIn-Craigslist hybrid tool. Chef’s Roll is endorsed by top chefs including New York’s Cedric Vongerichten and David Burke and Los Angeles’ Taji Marie and Fabio Viviani. Whether they’re a Michelin-starred chef or fledgling toque straight out of the Le Cordon Bleu womb, chefs can use Chef’s Roll to showcase their work, talent and originality to potential employers, customers, TV producers and more. Early adopters from across the globe range from San Diego pastry chef Annalise Brolaski, who practices organic baking, to internationally known culinary artists, including Michelin starred Gianfranco Chiarini, master of Italian nouvelle fusion, and Javier Plascencia, Baja’s reigning king of farm-fresh food. On Chef’s Roll profiles, chefs can enter skills and expertise; upcoming events; education and experience; a synopsis of the type of cuisine they specialize in; photos and videos; awards and accolades; client reviews; links to print, and online and television press. Technical co-founder Frans van der Lee built the platform to be easy and quick to use for time-starved chefs, while making it search engine optimized and social media friendly. The culinary tool also provides members with icons to use on other social media networks to link to their own profile, marketing and media training tips, recommended purveyors and, soon, a worldwide job/stage board. To get on a roll, chefs and culinary students should join at chefsroll.com. 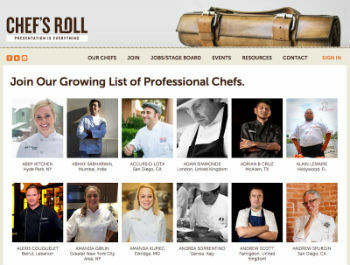 Chef’s Roll profiles cost only $19 per month or $99 per year. The founders of San Diego-based Chef’s Roll have always been passionate about the culinary industry, but it was only recently that they made a rather surprising discovery: the quality of a chef’s online presence almost never matches the quality of their cuisine. Working chefs often don’t have the time or budget to create a customized web portfolio, and existing job sites don’t have the tools to bring a chef’s unique skillset and experience to life. To solve this widespread challenge, Chef’s Roll was born. “Presentation is everything” is true for all chefs, and Chef’s Roll’s mission is to advance the culinary profession by helping to promote the chefs that are making it happen. From executive chefs to culinary students, Chef’s Roll welcomes you to the table. For all PR inquiries, contact Andrew Hard at andrew.hard@gmail.com or Brook Larios at brook@plainclarity.com.